Description: The mulberry oyster borer is a common inhabitant of the rocky shore. 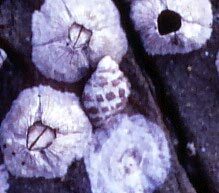 Like all molluscs it is covered with a membrane (outer skin) called a mantle, which in this case secretes a distinctive hard and lumpy shell. 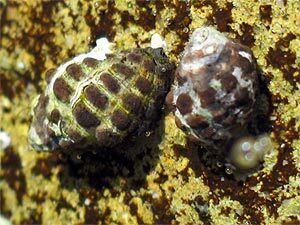 This species can be easily identified by the rounded nodules that spiral round the shell giving it’s a “mulberry” appearance. This assists in camouflage and attacks from predators. These nodules are dark purple to black while the background is whitish grey. Habitat: It is found in most areas of the rocky shore but is dominant in the white tube worm and barnacle zones. It has the ability to survive in dry areas due to the presence of a tough leathery operculum and its small shape which allows it to make use of protective crevices and fissures. The species can also be found in estuaries. Ecology: This mollusc is a carnivore which preys on barnacles, white tube worms and other molluscs such as oysters, hence its name. It is considered a pest in oyster leases where it can cause large amounts of damage. It feeds by boring holes into the shell or tube of its prey using its toothed radula, which is also assisted by the release of strong protease enzymes which help to break up the prey. Status: This species is not considered threatened or vulnerable but like all creatures using calcium carbonate to build their shell homes they will potentially be under increasing stress due to ocean acidification.